The Journal accepts papers that have not been published in or submitted for consideration to other publications, that satisfy the requirements detailed below, that have been peer reviewed (provided by the Editor's Office) and that have successfully passed a check for plagiarism. The optimum size of a paper is 5 pages, including any figures and tables. The electronic copy should be submitted as an MS Word 2003 document (its file name being the last name of the first author in Russian) on a CD or a floppy disk. The preferred methods of submission is by e-mail. A hard copy must be fully identical to the electronic file. The paper must have (in the same order): UDC, name, patronymic, last name of authors, abstract (not summary), key words, the body of the paper, a list of References, information about the authors; then, in English, last name and first name of the paper, title of the paper, abstract, key words. Information about the authors includes the last name, first name and patronymic, academic degree, academic title, position, place of employment, phone number, e-mail. The text must be arranged in two columns, without hard return, with a single line spacing in Times New Roman (font size 10 pt) on one side of white A4 writing paper and contain no erasures or insertions. For convenience, authors may use the paper template with pre-defined formatting. The volume of a properly formatted paper must be at about five pages. The paper must be consistent in its use of symbols and characters throughout the text, formulas, tables and figures. Cyrillic and Greek characters must be in regular upright type, and Roman characters (except for those included in regular words and their abbreviations, names of functions, software, companies and chemical formulas) must be in italic type. Formulas should be typed in Equation or MathType editor (MS Word). Cyrillic text, Greek characters, mathematical symbols (+, -, *, =, brackets, …) and digits should always be typed in regular upright type, and Roman characters denoting variables should be in italic type, except for those included in regular words and their abbreviations, names of functions, software, companies and chemical formulas (const, input; sin x(t1); Uin; Iвх;Тz; H2O, Adobe Acrobat, Сisco, etc. ); vector values should be in bold upright type (not italic) - А1, М(f). Formula templates can be found in the paper template. All designations and abbreviations must be explained when first used in the text. The paper must use the International System of Units (SI) and use the standard Russian designations separated by a single space (х, ГГц; 20 ГГц; Т, град; 7 °С). Decimal numbers must be written with a comma (not a dot). All tables and figures must have appropriate headings (not full-text references copied from the body of the paper). (Fig. 1. Title; Table 1. Title). Large legends should be preferably included in the text. All headings and titles should be in Times New Roman (font size 9 pt), regular type, no italics, variables should be the same as in the text. All figures and tables should be referenced to in the text (… in Fig. 3, … in Table 2). All figures and photographs should be in grayscale, sharp, hard, clean, grouped. Lines in charts and graphs should not be bold, grid lines should be clear. Units of measurement should be in Russian. Decimals should use commas (not dots). Figures should be executed in CorelDraw, Illustrator, Word, Visio and be editable. Illustrations should have at least 600 dpi. Image scale should be 8 or 16.7 across the width (provided that it allows legibility of any text written in Times New Roman, 9 pt). All sources in the list of references should be referenced in the text (numbered in the textual order, e.g., [1, 2], [5–7]). All sources should be represented in accordance with GOST 7.1-2003 and GOST R 7.0.5-2008 and include all information necessary to identify the source: for non-periodical editions: last name and initials of the author, full title of the work, place of publication, name of publisher, year of publication, number of pages; for periodicals: last name and initials of the author, full title of the work, title of the journal, year of publication, volume, issue, page number (see examples of properly formatted references). The list of references should have at least 15 sources. It is recommended that the number of author's works referenced does not exceed 20% of the total number of sources; about 20% in the list of references must be contemporary works (not older than 3 years) and about 40% must be international sources. The hard copy of the paper must be signed by the authors to signify their consent to publication. The paper must be accompanied by the Expert's Report and (for third-party authors) a cover letter on the organization's letterhead. All papers are published free of charge. The Editor’s Office will not accept any financial claims from authors associated with distribution of their materials after publication. Authors are solely responsible for the content of their papers and the consequences of their publication. 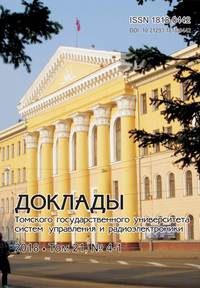 Any use of texts or graphics published on journal.tusur.ru must be accompanied by an active hyperlink to the TUSUR site.